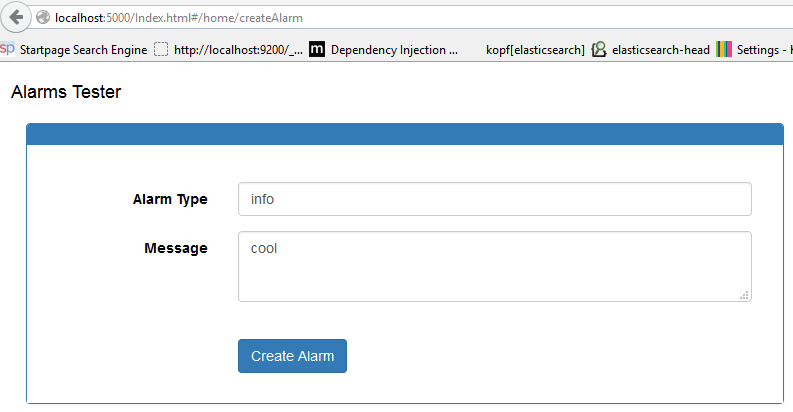 This article shows how to create an Angular application using ASP.NET Core 1.0 which can create alarm documents in Elasticsearch using NEST. The repository layer uses the new configuration from the beta 6 version and also the built in DI from the ASP.NET Core 1.0 framework. The post is part 1 of a three part series. In the following posts, events will be defined in Elasticsearch which will then be displayed in the UI using Angular. Before creating the ASP.NET 5 application, we want to update to the latest dnx version, at present beta 7. Usually, you would update to the latest stable version, leaving out the -u option. Use the -u for the latest version. To do this, run the following commands in the console with administrator rights. The default Web API vNext template is used to create the project. Then the project.json file can be edited. The latest packages are added in the dependencies in the project.json file. If these do not appear, you need to define the MyGet feed in the NuGet package settings. Only dnx451 is targeted in this application. This is because NEST and NEST Watcher are .NET 4.5 assemblies which cannot be used in core. I expect this to change once ASP.NET 5 is released. This is understandable, as it is very frustrating and complicated trying to update an existing .NET package to the new dnx core runtime. Many existing NuGet packages and libraries will struggle with this, unless Microsoft provide better support. I see a lot of headaches and long nights here. Now that the basic project, is setup, the default DI can be used. This is configured in the Startup.cs file. In the ConfigureServices method, you can add scoped, transient, singleton or instance definitions for your dependencies. These can then be added via construction injection in the controllers or child classes. Here’s an example of a scoped and an instance configuration. A good post explaining ASP.NET 5 DI can be found here. This is then used in the Startup.cs file and added as a instance type to the services. This has changed in beta6 version compare to beta 4. The configuration reference is added as an instance in the services. The configuration can be used via constructor injection in any class then. A SearchRepository class is used to define the DAL for Elasticsearch. This uses NEST from Elasticsearch to use the Elasticsearch HTTP API. Later NEST Watcher will be also added here. The class uses the AlarmMessage Dto for the alarms index and the alarm type. The last ten alarms and also last ten critical alarms can be queried using this repository. This will be improved in a later post. 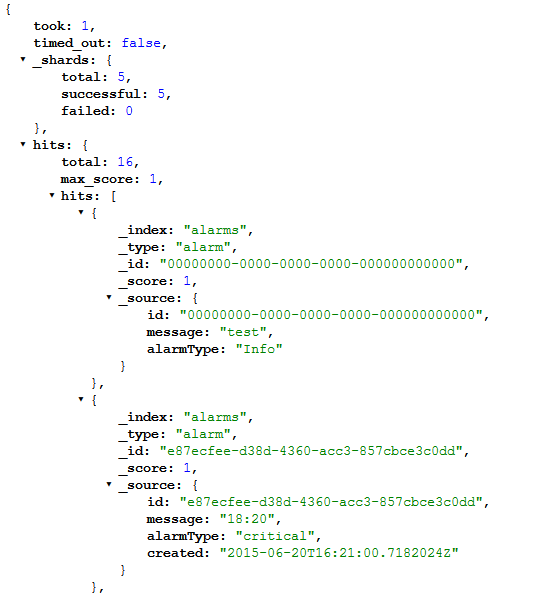 Now that the repository is programmed, this can be used in the AlarmsController. The SearchRepository is added to the AlarmsController using the built in DI. The Angular application for the client UI is setup using grunt and bower. You can check the gruntfile.json and bower.json to see how this is configured. Then a template is created for the Create Alarm form. This form can be found in the wwwroot/templates folder. The form uses the AlarmsController.js to handle the submit event. Now documents will be added every time you submit a request. The web is the command configured in the project.json file. Or of course, you can start it from Visual Studio. NOTE: You must also have Elaticsearch installed and running before the application will run. Now the basic application is up and running. The next step is to added Elastic Watcher and create some data events.